Black Tulip by Nest Fragrances - A modern chypre fragrance for women. This seductive scent, created by Laura Slatkin and perfumer Jerome Epinette, includes notes of dark cherries, sensual florals, violet, jasmine, oakmoss, and patchouli. 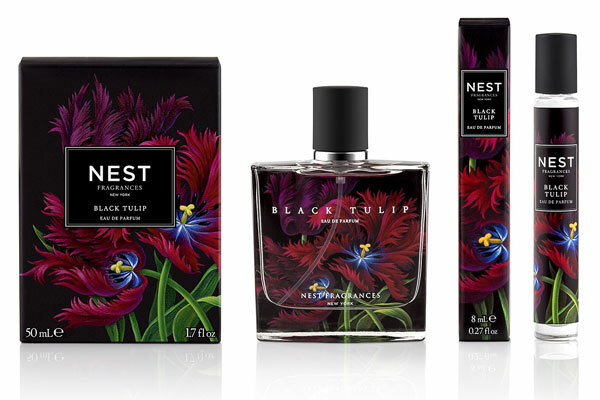 Inspired by a photo of a black parrot tulip, Slatkin worked with Russian artist Alexander Solodukho to design the botanical illustration on the Black Tulip packaging. Launched in February 2017 this alluring and feminine perfume is available in an eau de parfum spray and rollerball from Sephora. Package Design Artist Alexander Solodukho designed the botanical artwork on the perfume bottle. FIRST IMPRESSION: "You know when cantaloupe gets really ripe? There's definitely that melon-y, musky quality here." FRAGRANCE NOTES: An Oriental blend of black plum, patchouli, pink pepper, and Japanese violet. WINE EQUIVALENT: "I'm going to get a little crazy and say it's reminiscent of Gewürztraminer, a white that's spicy and has some candied orange peel." SOMMELIER VERDICT: "This perfume was tricky, because it's so complex. The muskiness is there, but also the melon notes and even some higher tones of grapefruit peel."